By the light of a half-moon we left the sleeping village. It was close to three o'clock in the morning when the little boat swung away from the landing on her voyage south. Far astern - a day's journey and more by waterway through the great swamp­ lay the city of New Orleans. Beyond, through ninety miles and more of lakes and bayous, lay a number of small is­lands, at one time the home of free­booters known as "The Pirates of the Gulf." That life has passed. But per­haps upon those low stretches of marsh­land there might exist even now the rem­nants of the once swaggering "Brethren of the Coast." All that had happened the day before was by way of introduction. We were now entering the real haunts of the pirates. Bayou and bayou; small lakes fringed with cypress and palmetto; great gaunt arms covered with moss; myriads of water fowl; a crawling life that moved unseen among the knees and roots of the trees; through such' a panorama we passed, mile after mile of bewildering waterway. The moonlight faded. After a while the eastern sky grew light with the early morning. And as the day broke the bayou became full of the uncanny mystery that seems to dwell within the deep recesses of a great swamp. 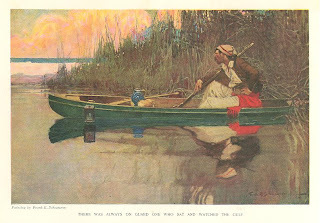 Fre­quently small bayous, some completely covered with the water hyacinth, led one in fancy far into the swamp and spoke of hidden treasure and the like. Now and then there was a glimpse of the deep swamp itself that extended for miles and miles beyond - an almost impenetrable morass of dismal quiet. The slowly moving panorama unfolded with an ever changing interest. Here the entire reach of bayou was carpeted with the water hyacinth. The inter­woven roots of the floating lily almost stopped the small powerboat as it cut away through the green, leaving a ragged, open trail of amber colored foam. Now there were signs of life. A small water craft had left a thin line of open water. The leaves of the hyacinth were still wet. The trail led on ahead and disappeared beyond the turn of the bayou. We fol­lowed. Suddenly we rounded the point, and there, almost hidden by the hanging moss, was a shelter for some nomad of the swamp, a hut, palmetto - thatched and raised high above the water on great posts of cypress. A dugout rested against the roughly fashioned steps. The still wet blade of a paddle glistened in the light. Traps hung from a railing of a small platform that served as a porch. And through a square hole that answered for a window came an impression of swarthy skin, straight, black hair, a spot of red, a few beads - then a twist of the bayou and it was gone. But it was life and gave promise of something more beyond. After a time the character of the country changed. The cypress swamp receded - it no longer bordered the high­way. Tall marsh grass grew upon the shallows. A sun, lurid, and hot, arose. Tiny threads of water separated the level stretch of low country into myriads of islands. Two or three trappers' huts broke the line of marsh. There was no other sign of human life. So we passed, always south, on the waterway where floated once the schoon­ers and polaccas of the pirates. Presently we left the narrow bayou, and passed into a large bay dotted with many islands. Crossing a portion of this bay, we drew close to a number of them that seemed huddled together. They were low and flat, covered with a rank growth of the pampas grass. Upon one of these islands there seemed indications of life. A col1ection of blotches - gray, white, and of color rose against the horizon. It was like the lay-in of the painter. From our point of observation these bits of color gradually resolved themselves into huts and houses and boats. And as we drew nearer there spread be­fore our eyes a great fleet of sailing-boats with red sails drying in the sun; dugouts, painted green and red, were tied to a long wharf that ran back to a huge plat­form upon which seemed to be spread something red. Facing this platform and extending back along a narrow bayou were twenty or more houses, all raised high above the water upon posts of cypress. We drew still nearer. The one bayou that penetrated the island divided into many smaller ones. Each house seemed to have its private water­way. Long ladders led from the porches to the water craft moored below. It was for all the world like a miniature Venice. The boat touched the landing and we stepped out upon a wharf that held a motley collection of staring, curious, half-clad human beings. We were face to face with as strange a lot of people as one might wish to see. Here surely was one of the haunts of Jean Lafitte. Before us, perhaps, were some of the descendants of the pirates themselves. For place upon this drift that has floated here from the four quar­ters of the earth a few silk rags and a gun or two, and you would have as fine a lot of pirates as ever graced a story or a picture. There were French Creoles, Mexicans, Spaniards, half ­tamed men of the Manila Island, dark skinned Indians from British Co­lumbia, and others of an uncertain ex­traction. Among them there seemed to be some who were not of the peace loving sort. So it behooved us to secure the friend­ly interests of the one who held this band in check. He was a man such as you might picture a leader of so strange a following. Large and of a powerful build, he had on a loose blouse such as the French peasants wear. His small, bead-like eyes were shaded by the broad rim of a black felt hat. The nose was large, the mouth drooped a little at the corners, and the lower lip protruded just enough to give the face the stamp of determination. With him we felt quite safe. So we walked along the wharf, passed into the shade of an open shed, and sat down. Why, amidst all this great desolation, was this island the harbor for boats and the resting place for human beings? They were not all seeking treasure, even if it was buried hereabouts. We looked about us. Far out across the bay were other sailboats, and the men in them, so our friend told us, were gathering their living from the water. We learned that there are other islands, like this, in­habited. And they are all concerned in the same industry - catching shrimp. Each island is a sort of factory where the catch is brought and prepared for the world outside. And the factory is a sim­ple affair. It consists of two huge iron caldrons in which the shrimp are boiled, and an immense platform a hundred to two hundred feet square upon which they are dried. These platforms dominate the entire island-everything centers about them. From their huge size the island and the others nearby obtain their names, for they are known as "platforms." Some­times the name of the owner is attached; again, the name of the bayou and per­haps a word in addition is pictured upon a board in rough lettering that gives one an inkling of the island's earlier life. Such is the case with this one, which is known as "Manila Village"; about the platform, in front of us were many of the dark-skinned Filipinos. The factory of Manila Village was very busy. The men who, a few min­utes before, had gathered to watch the strangers come into their little world were now at work raking and turning over great quantities of small red things. These men, with their polyglot chatter of tongues, were the fishermen, and spread upon this broad, smooth surface was their catch-hundreds of baskets of shrimp drying in the hot sun. The drying is only one stage of the industry. When the shrimp are brought to the platform, they are placed in the big iron caldrons and boiled in salt water. Then they are spread upon the platforms to dry beneath four days of the hot sun. On each of these four days the men go about and rake them over so that no part of the shrimp is overlooked in the drying. The platforms are built with slight inclines. If rain comes un­expectedly the partly dried shrimp, covered with tarpaulin, are pushed to the high portion of the platform. If this was not done the fresh water would wash the salt from the drying shrimp and the catch of a week would be lost. Once the shrimp upon the huge plat­form are dry, in a moment you may see the method of preparing the tiny lobster ­like creatures for the final packing - it is novel, picturesque, and extremely in­teresting. The scene changes and the final play is beneath the shelter of a roof. The mass of dried meat is carried to the shed and put into barrels. Some of the men, with hags tied about their feet, get into these barrels and walk about, packing the shrimp hard and tight. You are thankful the packing is done within the shade of the building, for the day burns hot and the platform reflects the heat of the trop­ical sun. The platform is swept clean. From the big iron caldrons another catch of shrimp is brought and spread upon the smooth boards. And the work of the day is done. It was now late afternoon. The men had gone, some to their bunk - houses and others to their homes - for in this great sweep of marsh country that bears upon its bosom here and there a bit of humanity there live women and moth­ers and their children. We could not see their homes from where we were seated; their dwellings do not face the big open platform that serves as the village square. But as we passed through the narrow way that separates two of the many storehouses bordering the plat­form, spread out before us was a wonderful and amazing decoration of thin silvery lines that seemed to rest upon the tops of the brown grass. These lines are narrow plank built highways raised high above the treacherous marsh below. They cross and re-cross. Like the veins of a leaf, they lead from the platform to the homes - to the small boat landings along the island bayou, and to the buildings far in the distance. We walked out on what seemed to be one of the much used highways. It was two planks wide, and at places of uncertain footing a rope was stretched as a guide. We left the walk where a high pole topped with a bird house marked a branching of the path, and went out over a cove that is a part of the big bay. The walk wavered about over the water. Boats, small and large, were moored to the long poles. Sometimes a fisherman passed, and we leaned far out to make room for him. Where a single plank­ way led to a house nearby we stopped and looked about. Farther along, the walk made a sweep into the bay, then turned abruptly to the shore and served as a foot path for five homes that dotted the island to the far end. Beyond the last house was a bit of grass covered marsh, and beyond across the water a thin strip of brown with some buildings huddled at one end. It was another platform vil­lage. The one or two white houses caught the crimson of the setting sun and added a note of color to the land­scape. A young girl left the house and came along the single plank path that led to where we were standing. Long, straight, black hair waved across her olive-brown face; the cheek bones were high and wide, the eyes large and black, and there was a touch of deep color in her full lips. She carried a baby in her arms. She passed with­ out a word and without looking at us. The sandaled feet found the trail with the sureness of an Indian, and she went along the way toward the plat­form without a sound. All about us proceeded the play of stealth, of quiet, of, bead like eyes; now a head, now a bit of color; a strange, uncanny, weird life enacted upon a stage of stilts. We lingered a bit to watch this ever changing life, then retraced our steps. The walk that trails about the houses near the platform was now peopled by the fishermen who do not have homes of their own, but who live in bunk­houses. All about they sat - on rude benches - on the plank walks with feet dangling in the marsh grass; and with tin plate and cup they eat the rice and oysters and drink the black coffee. There is a suggestion of the day of bet­ter things in the food of these uncouth harvesters of the sea. It is not in the manner of eating, but in the food itself. The coffee is made in a kind of per­colator, and the rice is flavored with the bay leaf. We threaded our way past the men, and crossed the platform to that touching the bay. The cool of the eve­ning was creeping over the swamp. From the deep marsh came the songs of the night. And over the turbulent com­munity settled a spirit of quiet and rest. Far out on the bay that is called Barataria shone a single light. It be­longs to another fishing island. Still farther to the south, perhaps but a mile, lies a long and narrow island known as Grand Terre or Barataria that one time was the home of the pirate Jean Lafitte and his band. Let us turn back to those days of ro­mance. On just such a night as this about the year 1809 a long, low pinnace moves abreast the island. There follows in tow a long rakish schooner called The Pride, with a four-pounder mounted on her forward deck. There is no sound save the low count of the tiller man and the answering swish and creak of the twelve long sweeps. There are no lights save those that shine from the after-cabin. The vessel moves slowly by. The light shines from the open companionway, creeps along the boom of the mainsail, and brings into relief a golden ear-ring. There is a fragment of a picture in the cabin and a table covered with a cloth of richly embroidered silk of deep orange - on this piles of yellow gold. Seated at the table are two men. One is a well-formed, handsome man, with black hair, hazel eyes, and pointed mus­tache. He toys with a cigarette and watches a thick-set man with a round, red face, who is busy with pen and paper. The schooner passes across the neck of the bay and into the winding bayou. A low laugh and the sound of clinking glasses come from across the water. The twinkling light from the cabin is lost and found. Finally it is blotted out. The pinnace and its treasure laden tow have entered the cypress bordered waterway that leads to a great city. A soft wind blowing out of the south called us back to the realities of the pres­ent. Tiny waves lapped gently against the many fishing boats. The masts moved back and forth against a sky that showed the first faint breaking of the dawn. It was early morning, and signs of life showed in the village. Little dots of light a shone from out the dark, leaving long, e wavering reflections in the water. From across the marsh and bayou groups of figures made their way along the walks. They gathered at the wharf and went to work immediately, freeing the schooners and working them to the end of the long landing place. We watched them as they moved about. If we had not walked among them but a day before, there might have been some just feelings of fear, some doubts as to what manner of men these fishermen were. It is known of a cer­tainty that Jean Lafitte. and his band of pirates sailed the bay and waded this marsh a hundred years ago. But we scarce hoped to see a life so similar to theirs. By the light from many lanterns we re­garded the men, as one by one the main­ sails were hoisted and the boats slipped quietly away from the island. There is no Jean Lafitte among them telling them whither to go. There are no cross-belts, no glint of pistols, no flash of color in my, the sash, no petticoat breeches; no, none of that. But there are men - black, red, and white - who speak tongues of many races. And there is a dark, bronzed man with gray hair, who is the oldest fisherman of Manila Village; his age is seventy-two, and he stands among these men as a captain. So the characters have changed but little. There may be less color in the costume; but even that note is saved, for the great sails are stained a turkey red; and now as the fleet of schooners gathered way and left the wharf these sails cut dark against a sky that was showing the light of early morning. We followed at a distance and watched the boats as they sailed slowly off the shore of the long, narrow islands. We could see the old captain - his bright green shirt moving up and down as he made cast after cast with a small net. Now and then he gets a shrimp or two in the net. After a time the schooner drops the peak of her sail and a seine fifteen hundred feet and more in length is played out. The captain has found a great school of shrimp, and the crew are working for the catch. Presently a lot of men, maybe a dozen, are splashing about, tugging and pulling in the marsh at a long rope. They sink knee­ deep in the ooze and mud; nothing but their heads can be seen above the tall grass. The net, the schooner, and the men seem to come together in one struggling mass, and we go near them to see what sort of treasure they have gathered from the deep. The bright green shirt looms up in front of us. The captain is shouting and cursing in French to this polyglot crew. The bag of the net grows smaller and smaller. There is a great commotion in the small patch of water that is surrounded by a part of the long seine. Presently the captain tells them to stop. Then with long handled dip-nets the live shrimp are lifted and dumped into the schooner. The captain and his crew are fortunate, for with the last dip of the hand ­net the catch is estimated to be a hundred baskets. The Captain takes some papers and tobacco from the pocket of his green shirt and rolls a cigarette. The crew hoist the sail, and as the boat moves slowly away for the distant platform the first rays of the rising sun catch the peak and turn the color to crimson. Such is the manner in which these men take their harvest from the sea. Their long net passes over they know not what. For here­abouts much treasure of the pirates was buried. About us now were many boats, schooners, luggers, and yawls. They are from the other platforms, and are sailing slowly back and forth in search of shrimp. Perhaps they will work all day without wetting their long seine, for the schools are not always found with ease. From among these boats one passed close by. The crew crowded to the edge to look at us. Some leaned on their long, thin arms. Others looked over the backs of those in front. The skin of these men is yellow and their hair is braided and wound about the head. By and by we came to another platform, in appearance very much like the first, but the people who live here are all Chinamen. The village is called "Bassa Bassa," meaning very low and very flat. On the platform the men in their wide, flopping trousers and loose shirts moved about like cats. The yellow, lean, long­haired men of the Orient keep to themselves. Upon three of the islands they dry their catch, and no man save the Chinese owner knows aught of their doings. We had now passed the last of the fishing villages. In the great bay of Barataria, among no one knows how many islands, there are seven such communities, with their motley collection of human beings. Fugitives from justice, mur­derers-the scum and drift of the world, yellow and black and white. Some with their women, some with their wives, others with a lust for they know not what - a lust that is kept within the smoldering by the iron rule of the island government. Such is the life that exists nowadays upon the islands that lie within the shelter­ed waters of the great Barataria. A long, thin strip of land cuts across the lower part of the bay and protects it from the storms that sweep the Gulf of Mexico. A natural pass some two thousand feet wide divides it into two islands known as Bara­taria and Grand Isle. From the last of the fishing villages we could see the outlines of the islands and the small break that mark­ed the pass. As we drew nearer there spread out upon either side of the pass long, level stretches of sand. To the west was the long strip called Barataria. A few live oaks marked the one slight eleva­tion of some five feet above sea level. The is1and was quiet and peaceful. A few cows grazed upon the sparse vegetation, and at the end near the pass stood a lighthouse with its lonely occupant. One time, however, this island was rife with its conglomerate mass of human cut­throats. Here were gathered, about a hundred years ago, French and English, mulattoes of Santo Domingo and the West Indies, Indians of Mexico and Cuba - all blended into a life lawless and dar­ing. Privateers they styled themselves; sea rovers, robbers, and pirates they were, a wolfish swarm that gathered the loot of gold and cloth and women within the wan of their town. They paid tribute at a house that was built of brick - where a hammock swung under the pillared porch and where the walls within were hung with the silk from Spanish mer­chantmen. The robbers held their hats in hand when they stood before that house, for there lived Jean Lafitte. Beyond, in a street of crowded, filthy houses made of wattled twigs and pal­metto leaves, lived the scum and off­ scorings that composed his band. A thousand strong, they rested content within the protection of the fort. The broad waters of the Gulf lay in front of them. It was their hunting ground, and from it they brought their catch of silks and gold and their pounds of flesh to the den at Barataria; there to be divided among the hungry lot in ap­portionment as Jean Lafitte and his lieutenants willed. And as they snarled arid fought for the treasure of the dead there floated in the quiet of the bay their fleet of brigantines and schooners, even as to­day float the boats of the peaceful fish­ermen. But that time there fluttered from the mast-head of each vessel a flag of the new government of Carta­gena, for Cartagena was then struggling for independence, and Lafitte found it very easy, in directing the gentle busi­ness of the privateer, to stretch his commission of cruising against the Spanish Royalists into one of entering and blockading the Spanish ports of Mexico and the West Indian seas. So the treasure poured into Lafitte's stronghold. At one time there were pieces of gold and goods within the fort on Barataria to the value of five hun­dred thousand dollars. But the loot was not long resting on the island. Schoon­ers wound their way through bay and bayou to New Orleans. There Lafitte's brothers, Pierre and Antoine, in brazen effrontery to the law, sold the goods in open market, and the gentlemen of the great city were not above purchasing what suited their fancy. 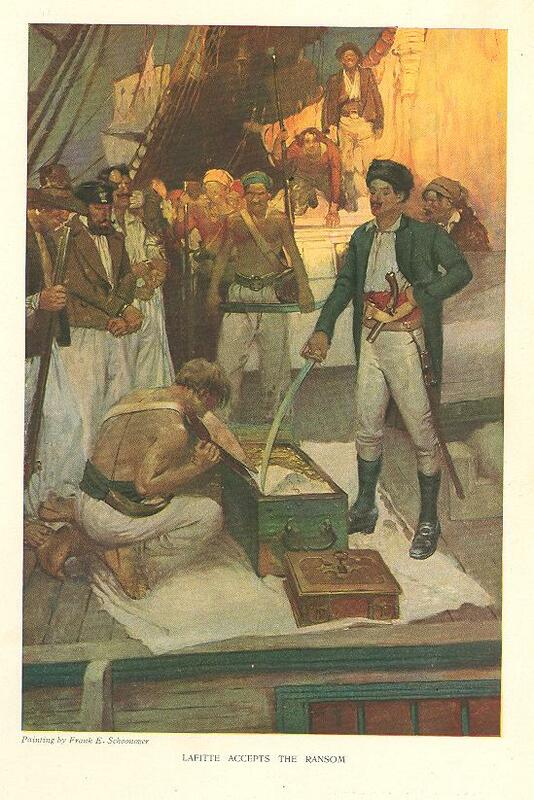 It was not always convenient for Jean Lafitte to dispose of the precious loot. So with­in the bay - upon some of the islands now inhabited by the fishermen, store­houses were built. In them, shelf upon shelf, the cloth and silk of the Far East were stored. But the gold was hidden with great secrecy, and, more­over, amid surroundings that were truly picturesque. Within the deep recesses of the cypress swamp, and in the bayous but a few hundred feet from the fort, the gold was secreted safely in iron chests. The pirates worked within the shelter of the tall pampas grass. And beyond, near the open, there was al­ways on guard one of the keen- eyed robbers who sat in his green pirogue and watched the Gulf. Undoubtedly the treasure was very well buried, for even to this day but little of it has been recovered. 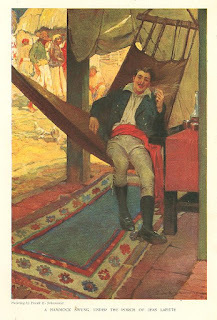 Upon occasion, however, the pirate chief was in sore need of ready money, and it is told that in the dark of a November night about the year 1811 Jean Lafitte with one schooner sailed from Barataria and later anchored with great care within a port of the West Indies loading a long, low pinnace with an armed crew, he landed and in a short while returned with his prisoners, the governor of the town, his secretary, and the holy Father Confessor. With great show he conveyed the precious trio to his schooner and there informed them that as the commander of a Cartagenan man-of-war, he had been instructed to seek them out and administer punish­ment for their acts of piracy. And, moreover, and what made the matter still worse, they - the gov­ernor, his secretary, and the holy Father Confessor - were in league with one Gibbs -a most notorious American pirate. And as a matter of just and reasonable punish­ment for their crimes, he, Lafitte, had prepared three nooses that hung from the yard-arms; and he was quite ready to set the governor, the secretary,. and the holy Father Confessor swinging unless a sum of fifty thou­sand dollars should be forth­coming immediately. The governor and his companions denied by every saint in the calendar all knowledge of "el infame Don Gibbs" and the acts of piracy charged against them. But Lafitte insisted upon fifty thousand dollars as a ransom, or the decoration of the yard-arm, at which the holy Father Confessor begged the gov­ernor to save their lives for the future betterment of the town. So the secretary was sent on shore, and the gov­ernor and the holy Father were entertained on board the schooner. After a time the secretary returned with the amount in gold Lafitte thanked them for not detain­ing him longer, and with presents of fine wines set them upon shore again. In such a gentle manner, without a flash in the pan or the soiling of a cutlass, did Jean Lafitte gather his thousands, later to be used in wondrous hospitality in a great city. But the very freedom that Lafitte used in gathering his wealth, his terrible looting of the Gulf merchantmen, and the utter demoralization caused there­by to the commercial interests of New Orleans - this very freedom was his undo­ing, for Governor Clai­borne, of Louisiana, in March, 1813, ordered the freebooters of Ba­rataria to disperse. This proclamation was hailed with outrageous joy by the pirates, and when the gov­ernor offered five thou­sand dollars for the handsome head of La­fitte, the rover re­sponded by placing fifty thousand dollars upon the head of his Excellency. The establishment was but 1ittle disturbed by the price of blood placed upon their chief. For more than a year the loot from the Spanish mer­chantmen poured into the strong boxes at Barataria. The peaceful life of the free­booters continued unmolested save by a threat now and then or an abortive ex­pedition. But in the month of Novem­ber of the year 1814, while Jean Lafitte was in New Orleans, the fort, the red­brick house, and the hovels were de­stroyed. All this was done by Com­modore Patterson of the United States navy, with his fleet of gunboats and an armed schooner. The pirates made a fine showing with their seven schooners and a felucca. They established a line of battle - and then for some reason they deserted their vessels without firing a shot, and in small boats hid among the islands and bayous of the swamp. The pirate's home was brushed from the island. The salt marsh crept over the private canals and along the sandy reaches peace and quiet again brooded over the narrow strip of land. And there remained naught but the uncertain ac­counts of historians and the vivid and doubtless true stories of the one or two descendants that ring with proof of the one time life of the freebooters. So we left the island of Barataria, crossed the pass, and made for the strip of land that is called Grand Isle. This island is part of the natural gulf wall and bears the brunt of the storms that sweep the Mexican waters. The present desolation that has stamped itself upon Barataria is not apparent here. Some live oaks give shade for the cattle that, roam about, and as we walked along what seemed to be a road we saw a few dwell­ings and bits of ground from which the cucumbers had started to grow. A few people live upon this sandy stretch of land, and for the most part they are a race unto themselves. They have descended from the men of Lafitte's band and from the women they brought as captives from the Southern seas. Per­haps the few who were at work in the earth imagined we were seeking stories of their forebears, for they looked at us with misgivings and withdrew to a safe distance, where they talked among themselves in their French patois. It was very dif­ficult to engage them in conversa­tion. They were suspicious of the slightest move, so we kept on our way and found after a while one among them who was kind­ly disposed and was inclined to treat us in a manner of hospitality as best he could. He was a man seventy-six years old, and his name was Prosper Pellant. He was very feeble. He suffered from an in­curable disease, but his thin smile was one of open honesty, and he asked us to enter his house. We went into the kitchen. Prosper sat down upon a stool that was in front of a smoldering log fire, and filled a pipe from a curious bag that served as a tobacco pouch. The bag was quite large and wonderfully embroid­ered with what seemed to be threads of silver and of gold. It suggested im­mediately a question of its history, but the owner put it away very quickly. Per­haps he saw us looking at it. After a time the withered face of Prosper seemed to glow with kindly recollections. He arose and conducted us to the other room of the house. It was dark and musty. He unfastened the heavy shut­ters that were held by hand wrought clasps and pushed them slowly back. With the light there came the vis­ualization of what almost appeared to be some kind of apparition. Upon the bare, discolored walls hung a single decoration - a large painting. It was a portrait of a young lady, very beautiful and undoubtedly Spanish. We judged from the costume that the portrait had been painted sometime during the latter half of the eigh­teenth century. The frame was heavy and quite elaborate and had been fin­ished with gold leaf. Prosper looked at it and with a ten­der wave of the hand said, "The mother." And then to explain, as if we might not understand, he added, " Of my wife, M'sieu - the mother of my wife." Then he closed the heavy shutters, and we went back to the kitchen, and Prosper to his fire. Perhaps after a time he would tell us something of the picture, how it happened to be on the island and in his house. It was long before he spoke again, and when he did it was as though all of us had been thinking of the same thing - the portrait.
" Yes, M'sieur, my wife's mother. Her name was Genevieve, and she came to this island, or perhaps the other (mean­ ing Barataria), many years ago. She married an Italian, by name Chighizola - he was called also 'Na Coupai' be­cause he had no nose and was therefore a very great fighter." The old man lapsed again into silence. What he did not tell and what after­ward we found out was this: that Gene­vieve and the portrait had been brought in by the pirates as part of the spoils of an expedition; that Genevieve was a great beauty, and when she was brought ashore at Barataria a great fight followed for her ownership. And in the struggle the man Chighizola lost his nose. At any rate, no matter if the nose was lost at that time or not, the portrait still remains to this day as proof of all that has been said about it. It had grown dark within the house; Prosper stirred the fire and continued with his detached bits of conversation that pictured with what could be no greater vividness the life of the delta a hundred years ago and more. Jean Lafitte lives in the memory of Prosper, and he told of treasure and of place in a way to make one determine to look for himself among the islands. "Just below my house, M'sieur, some little ways, on the Bayou Regault, there is a great pile of oyster shells, and near them a deep hole in the bayou. There is much treasure buried there, for not long ago Rigard, a fisherman who was digging for oysters near the deep part, found an old cannon and brought it ashore. It was of bronze and had some Spanish lettering on it. Some said there was a date, but I do not think so; but you can look for yourself, for the can­non is in Rigard's yard. This was proof of a sort, but the ab­solute and indisputable proof of iron chest and buried gold came. when Prosper. with his black; eyes glowing, told of a deep hole in one of the bays where gold to the value of ten thou­sand dollars had been lowered and lay buried in the muddy bottom many feet below. "And it's true,'" continued Prosper, in almost a whisper. "Every word is true, for I myself as a boy have been in swimming in that very place, and it is deep, for I know." And it was not only of buried treasure, but of other things he told; at no time did he mention the name of Lafitte, but the grouping of the words and his whispered emphasis conveyed sufficient mean­ing. He told about an aunt that lived with him for a long time. Said Prosper: "The aunt lived with us for thirty years. She was old, as it goes with us here, when she came. She told us of things she had seen in those times. And I remember, what always stuck to me as a boy, how the aunt carried the keys of a storehouse because she was one of them, and of how in the storehouse the shelves bent with the weight of jewels and gold trinkets!" And Prosper might have proved that too, if he had shown again the tobacco­ pouch. But he was tired and sick so we left him beside the fire and passed out and along the bayou that held so much treasure within its windings. The cool of the evening had settled once again upon the marsh. Under the quiet of the night there slept upon the distant islands a parti-colored race that differed scarcely a whit from the life of 'which the old man had been speaking. The fishermen were the pirates, the piles of' shrimp were their piles of gold, the chances of buried, treasures were their Spanish merchant­men, and the owner of their village, was their Jean Lafitte. Originally published in Harper's New Monthly Magazine. December 1911.